I don’t know where the summer has gone. Welcome to our new Grange year. If you have had a bad year it’s time to put it behind you and get a fresh start. We all need to strive to make our Grange better. We have to work together and build our attendance. The Grange has many good programs. Let’s take advantage of them. The programs printed last year were for two years so you should be all set to start thinking about them. If you need a new copy, just let me know and I will get it to you. With the impending changes in our Pomona Granges we won’t be receiving new program books this fall. I need your help. If you have a new Lecturer in your Grange, please let me know so I can get them the information they need. All Lecturers receive a newsletter every other month. This newsletter keeps them up to date on current programs and contains numbers that can be used as part of your programs. 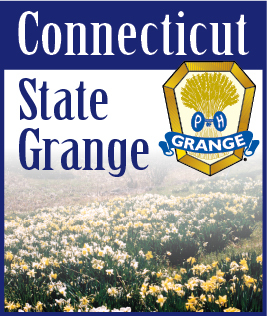 October also means it is time for our State Grange Session. I hope your Grange will be represented when we pass out the Lecturers’ Awards at the Celebration Banquet on Friday Night. As I write this I don’t know how many Granges will get recognition in the Lecturers Department but I hope that you will congratulate those who receive these awards. They worked hard on your behalf. Entertainment for the banquet will be by Ashly Cruz. She entertained at Cheshire Grange last spring and was a big hit. I’m sure you would enjoy seeing her in action.